Look at the world around you. Notice all the colors, textures and shapes. Amazing, right? It’s your eyes that allow you to see all that yet we rarely think about taking care of them — until they start to experience problems. Age-related macular degeneration (AMD): Currently affecting about 2.1 million Americans, this disease occurs when the macula, the small area at the center of the retina in the eye, becomes damaged. As the disease progresses, the center of vision becomes blurred. Glaucoma: Currently affecting about 2.7 million Americans, this disease causes extra fluid buildup in the eye. That increases pressure inside the eye, and if that pressure is not relieved, it can damage the optic nerve and lead to vision loss. Peripheral vision is affected first. Diabetic retinopathy: Currently affecting about 7.7 million Americans, this disease is a complication of diabetes. High blood sugar levels can damage the blood vessels in the retina, gradually affecting vision. Early symptoms include the appearance of “floating” spots and overall blurred vision. Cataracts: Affecting about 24 million Americans, cataracts occur when the lens in the eye clouds over because of protein buildup. Vision appears blurry and hazy. Most cataracts develop slowly and can be corrected with surgery. Unfortunately, the number of people with vision problems is increasing, mostly due to the aging population. The Centers for Disease Control and Prevention (CDC) states that vision impairment “is a serious public health concern,” with the prevalence of blindness and vision impairment increasing rapidly with age. Vision loss doesn’t just affect your eyes — studies show that when your vision dims, you may experience other health problems too. Those who suffer from vision loss have a higher prevalence of chronic health conditions, falls and injuries, depression, social isolation and even death. None of us likes the idea of not being able to see as well as we get older. Is there anything we can do about it? We’ve got 15 tips for keeping your eyes healthy as you age and for reducing your risk of vision loss. Hopefully, you’re already doing this, but if not, it’s time to add more fruits and vegetables to your plate — if not for your heart, then for your eyes. They need the vitamins, minerals and antioxidants in these foods as much as the rest of your body does. The National Eye Institute says that a diet rich in dark leafy greens like spinach, kale and collard greens as well as fish like salmon, tuna and halibut is important for keeping eyes healthy. In fact, according to a 2014 study, as the quality of diet improved, the risk for visual impairment decreased. On the whole, get a variety of fruits and veggies in your diet, and your eyes will thank you. You know that too much sugar isn’t good for you, but did you know that it can negatively affect your eyes too? In the study mentioned above, researchers found that a healthy diet helped maintain healthy vision. 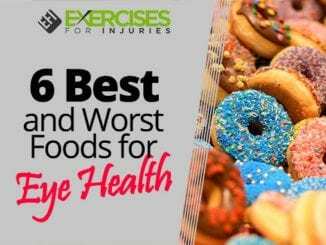 They also found that a high consumption of added sugars and refined carbohydrates, along with a low consumption of plant-based foods, directly contributed to an increased risk for multiple eye diseases. It’s not just sugary treats we’re talking about. 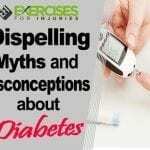 Simple carbohydrates like those that exist in white bread, white rice and white pasta break down quickly in the body, resulting in blood sugar spikes. 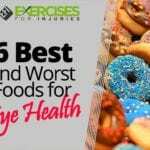 Eating too many of these foods can also cause problems for the eyes. A 2007 study found that overconsumption of sugary, starchy foods increased the risk of AMD. A 2015 study found evidence that high blood sugar levels increased intraocular pressure in the eyes — a risk factor for glaucoma. Excess sugar may also lead to the protein damage and clumping that occurs in cataract formation. For your overall health and your eyes, limit your consumption of added sugars and simple carbohydrates. You’ve probably heard that some fats are healthy, but when it comes to saturated fats, it’s best to avoid the unhealthy kind for the sake of your vision. According to a 2009 study, diets high in several types of fat may increase the risk of AMD. Both total fat and saturated fat contributed to the risk. That means that a diet high in fatty beef, butter, cheese and cream could be bad for your eyes. A high intake of dietary fat has also been linked to dry eye syndrome in women. Researchers found that a high intake of omega-6 fatty acids, in particular — the type found in cooking and salad oils and animal meat — increased the risk. Not all fats are unhealthy for you, but these that we’re talking about can also increase the risk of artery narrowing and cardiovascular disease, so it’s best to limit your intake. While you’re cutting back on cheese and fatty beef, consider upping your intake of fish and walnuts. These contain healthy omega-3 fatty acids, which have been found to help protect eye health. In the study mentioned above, omega-6 fatty acids were associated with an increased risk of dry eye syndrome while omega-3 fatty acids were associated with a protective effect. Women who reported eating at least five servings of tuna per week had a 68 percent reduced risk of dry eye syndrome compared to those who ate only one serving a week. In the other study mentioned above connecting fat intake with AMD, researchers also found that those who consumed more monounsaturated fatty acids had a lower prevalence of the disease. Monounsaturated fats are found in foods like olive oil, safflower oil, sesame oil, peanut oil and canola oil as well as in most nuts, avocados, peanut butter and olives. Overweight and obesity are connected with an increased risk of eye diseases. Obesity has been found to be a risk factor for cataracts, with one study showing that people with a body mass index (BMI) of 30 or higher had an increased risk, although scientists weren’t sure why. In one 2009 study, researchers reported that numerous population-based and prospective studies “support an association between obesity and risk of age-related cataract.” Obesity has also been linked to an increased risk of diabetic retinopathy, AMD and, in some studies, to increased intraocular pressure. Scientists are still figuring out exactly how excess weight affects the health of the eyes but, for now, it’s enough to know that maintaining a healthy weight may also help you maintain healthy vision. Destructive molecules called free radicals lead to oxidative damage, which can hurt the eyes and lead to vision loss. We generate free radicals as a part of our normal metabolism—which is why a healthy diet rich in foods high in free-radical neutralizing antioxidants is important—but we’re also exposed to them when we go outside. The sun’s UV rays have been linked to cataract formation and retinal damage. Scientists believe that the rays initiate the formation of free radicals, which then cause oxidation and protein clumping. In 2014, a study funded in part by the National Eye Institute confirmed that the sun’s damaging rays cause oxidative stress in the eye. Researchers recommend that you wear sunglasses every time you go outside to protect your eyes. Make sure they are broad-spectrum glasses, so they protect from both UVA and UVB rays. Even if it’s cloudy, the UV rays still get through, so consider getting a pair of lighter lenses that will continue to protect your eyes while allowing you to see clearly. In addition to sunglasses, if you’re participating in activities that may harm your eyes, it’s critical that you use the appropriate eyewear. You may think you’re already doing this but, chances are, you’re not. According to the American Academy of Ophthalmology (AAO), nearly half of all eye injuries that occur each year occur in and around the home, where people are less likely to use protective eyewear, and these injuries are increasing each year. Ask yourself: When you’re doing yard work, construction projects around the house or using power tools, are you protecting your eyes? Only 35 percent of Americans surveyed said they wear protective eyewear when doing home repair or home projects. Of course, you can harm your eyes at work or when participating in sports, if you’re not wearing the right gear. More than 40 percent of eye injuries every year are related to sports or recreational activities. In general, if you’re working with anything that involves flying particles, objects or dust, wear safety glasses with side shields. If you’re working with chemicals at work or home, wear goggles. If you’re working near radiation, such as with welding or lasers, use special-purpose safety glasses. If you’re cleaning, doing yard work or doing home improvement projects, keep your protective eyewear on hand. It reduces the risk of eye injury by 90 percent. Smoking increases your risk for heart disease and cancer, and it can also increase your risk of vision loss. The CDC states that smoking increases the risk for AMD and cataracts. Specifically, if you smoke, you’re twice as likely to develop AMD as a nonsmoker, and you’re three times more likely to develop cataracts. Smoking also increases the risk of high blood pressure, which is a risk factor for glaucoma, and it doubles your risk of dry eye syndrome. If you smoke already, do everything you can to quit. Here’s something to think about: Use your laptop or desktop computer for just two hours, and you’re going to experience a significant increase in eye pain and tiredness, blurred vision, itchiness, gritty eyes, dry eyes and tearing. This is what researchers found when they watched a group of healthy adults with normal vision work on their laptop computers. Scientists found that computer work is demanding for the eyes, and increases eyestrain fairly quickly. If you use the computer for hours every day, you’re probably feeling the effects. Take steps to make it easier on your eyes. Sit at arm’s length away from the screen — if you can “high-five” your screen with arm fully extended, you’re too close. Remind yourself to blink often, and every 20 minutes, take at least 20 seconds to look away from the screen at something in the distance. In addition, don’t work in areas where the lighting is too bright — it increases eyestrain. The light around you should be about half as bright as normal. Turn off the overhead fluorescent lights and use floor lamps positioned to the side of you instead. Finally, think about getting an antiglare screen for your monitor. Are you careful about cleaning your contacts every night? If you’re not, you could be increasing your risk of an eye infection. In a recent study, researchers found that contact wearers had three times the usual proportion of certain types of bacteria in their eyes than noncontact lens wearers. These bacteria were associated with serious infections. Always wash your hands before dealing with your contacts, and rinse contacts with fresh solution only. Get a new contact case every three months. Replace your contacts when your doctor recommends, and don’t sleep, shower or swim while wearing them. These activities increase the risk of infection. If you consume too much sodium in your diet, you could increase your risk for eye problems. Studies have suggested that higher sodium intakes are associated with a higher risk for cataracts. Researchers think this may because salt regulates fluids in the body and that high amounts may contribute to the protein deposits that cloud the lens. A high intake of sodium is also linked to high blood pressure, which can lead to vision loss. Most of the excess salt in today’s diet comes from processed foods. Read labels and try to keep it under control. If you’re not drinking enough water, you could be robbing your eyes of the moisture they need to be comfortable. In fact, if you’re experiencing dry eyes, try drinking more, and see if it helps. According to a 2015 study, up to three-quarters of Americans drink well below the recommended levels of fluids, which means that a lot of us are running around slightly dehydrated. That can lead to fatigue, headaches, mood swings and other problems, including dry, itchy eyes. 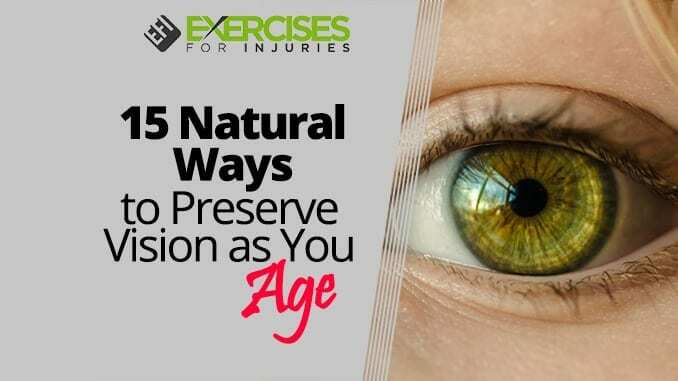 You know that regular exercise is good for your overall health, but your eyesight? It’s true — that daily jog can go a long way toward protecting your vision. Studies have shown that those who exercise regularly are less likely to develop serious eye diseases. In one study, for example, people who exercised at moderate levels on a regular basis were 25 percent less likely to develop glaucoma than people who were mostly inactive. In another study, those who exercised at least three times a week were less likely to develop AMD than those who didn’t. You don’t have to go crazy with it. A daily walk can do the trick. Tea has healthy nutrients called “catechins” that help protect the tissues of the eye from oxidative damage. In 2010, researchers reported that these nutrients were capable of penetrating the tissues of the eyes and acting as antioxidants there. Other research suggests that tea may help protect against cataracts. In 2016, scientists found that tea drinking was associated with reduced risk of age-related cataracts and that compared to nondrinkers, green tea drinkers had a significantly reduced risk. The natural antioxidants in tea may also help protect against AMD. It’s true that certain nutrients are critical for good eye health. These include vitamins C and E and beta-carotene as well as zinc, lutein and zeaxanthin. 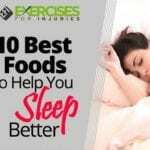 You can get all of these from food, but it can be tough in the rush of daily life to consistently eat all the foods that will give you enough of these nutrients. Should you turn to supplements? It may help to fill in the gaps but beware of the marketing hype behind some eye health products. According to a 2014 study, claims made by top-selling eye vitamin brands lack concrete scientific evidence to back them up. Worse, many of the most heavily promoted brands didn’t contain the ingredients and dosages found to be effective in studies. Finally, don’t forget to see your eye doctor at least once a year. He or she can help detect eye problems early when they’re treated most easily and effectively.